Voter registration is a key measure of immigrant integration. After all, what could be more American than casting your ballot on Election Day? 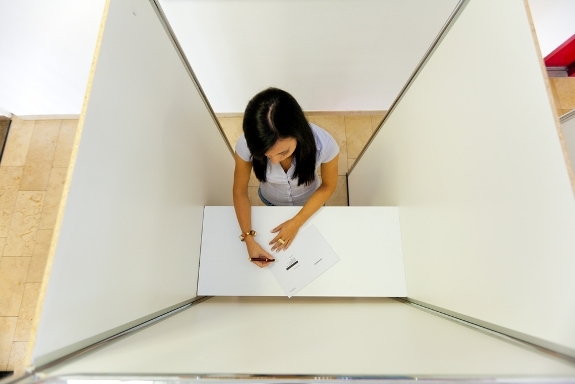 When measuring immigrant voting patterns, voter registration is typically defined as the percent of naturalized immigrants (those who have become U.S. citizens) who are registered to vote. In other words, we only look at those currently eligible to vote because they have naturalized, instead of looking at the percentage of naturalized registered voters against all immigrants, documented or undocumented. The problem with that approach is we miss a big and important picture on the potential of the immigrant voting block—that many of those not eligible now, may well be eligible in the future. Most immigrants are naturalized citizens or legally residing noncitizens. However, if we want to know overall voter registration, we would include all immigrants in the base, including the undocumented, when calculating registration. The result would tell us more realistically how many immigrants have the potential someday to vote and, importantly, would tell us if the percent is rising or falling. 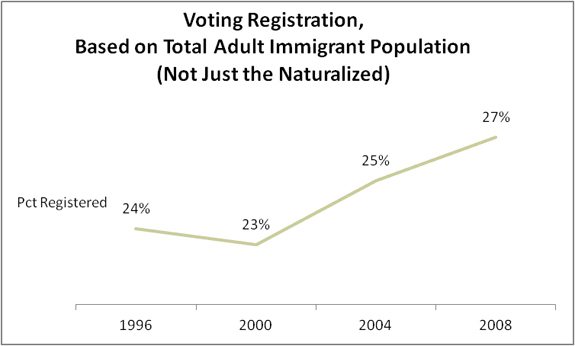 Using this calculation, we see a clear increase in immigrant registration over the past few election cycles, from 24 percent in 1996 to 27 percent in 2008. 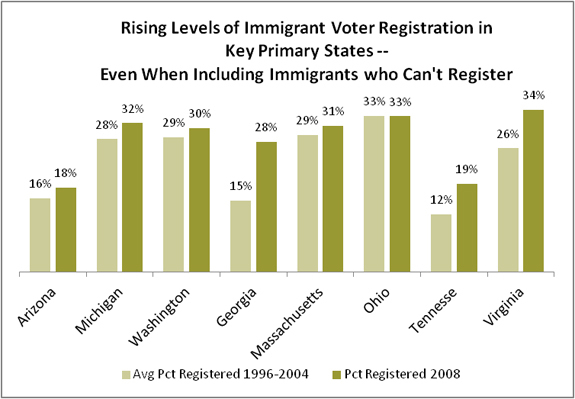 In other words, a larger and growing percentage of the entire immigrant population is registered to vote. Eight states have large or rapidly growing immigrant populations and will host a Republican caucus or primary between now and Super Tuesday, March 6. Using a more inclusive estimate of voter registration that compares immigrant registration in the last Presidential election to the average over the previous three elections, we see an upward trend. In every state but Ohio, a larger percentage of the entire immigrant population is registered to vote and the trend is on the upswing. Demographically speaking, it is no small feat to increase your registration rate in an era of significant immigration. It means that naturalization is outpacing immigration of noncitizens who don’t or can’t register. In order to experience this level of growth on your voter rolls, you would have to experience a significant rise in naturalization and voter registration rates to offset the overall increase in the size of the immigrant population. Indeed, that is the trend. These trends are remarkable because they are taking place in an era of immigrant bashing, in which political candidates routinely degrade the contributions of immigrants. One could expect immigrants in such a climate to refrain from civic participation in a system that says they are not wanted. Yet in spite of a hostile reception, immigrants are choosing to become more, not less, engaged in American society.